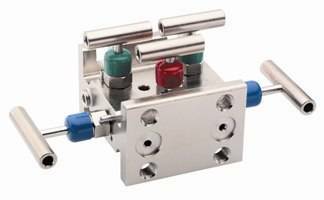 Noshok now offers several 5-valve manifold options, designed for use with differential pressure transmitters. These manifolds employ two isolation valves, two equalizing valves and a vent valve for use in natural gas applications. Backed by a 3-year warranty, these manifolds are available in block, single flange or double flange connections for remote or direct installation. The manifold bodies are machined from cold drawn extrusion, allowing NOSHOK to hold tighter tolerances than many competitors’ valves. In addition, all NOSHOK valves are 100% Helium leak tested to 1 x 10-4 ml/s for guaranteed performance and reliability.